I’m looking forward to seeing many of you next week! 3 Comments on "Member Meeting next week"
Our Bullwinkle restuarant and bar endeavor is hoping to re-open soon. 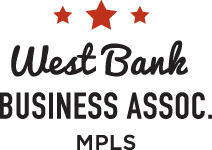 As new, as of today, members of your fine West Bank Business Association we are looking forward to participation (this afternoon at Augsberg) and joining in Westbank business-to-business and community service association. Thanks Rob! I’m looking forward to seeing you this afternoon. Hi Jamie, Thanks for the reply. My bio is shown below. A business software professional with American Health Management Assoc LLC (dba Bullwinkle Saloon) and community education experience as well as SAS programming, quality assurance, and teaching skills. Professionally, Rob is a recently retired CVS/Pharmacy Analyst, currently teaching SAS for Softech International, and doctoral candidate with Walden University. With a Health Services focus, the dissertation title is – Marketplace clinics: Diabetes care complement for Native Americans. Educationally – a licensed Minnesota State Colleges and Universities Instructor, Registered Industrial Engineer, and Masters of Public Health, University of Minnesota. SAS training includes both classroom and on-line courseware and am currently teaching at Forest Lake Adult Learning and developing University of Minnesota/Community partner courseware. Special area interests are Indian Education Parent/Grandparent Committee, Metropolitan Urban Indian Directors, Minneapolis Public Health and Families Advisory Committee, and Native American Health Management Association (www.nahmacare.com). Prior community service includes 3-term elected community at-large hospital board member (District Memorial Hospital; now, Fairview/University Lakes Regional Hospital).